1. Upper portion showing bifurcate tips. 2. Fragment with cystocarps. 3. Longitudinal section through cystocarp. 4. Habitat (overgrowing the lobster farm constructions at Mot Island, Nhatrang Bay, Vietnam).. 29 Feb 2012. Eduard and Tamara Titlyanova (etitlyanov@mail.ru). © Eduard and Tamara Titlyanova (etitlyanov@mail.ru). Published in: Gurgel, C.F.D. & Fredericq, S. (2004). Systematics of the Gracilariaceae (Gracilariales, Rhodophyta): a critical assessment based on rbcL sequence analysis. Journal of Phycology 40: 138-159. The type species (holotype) of the genus Hydropuntia is Hydropuntia urvillei Montagne. Type locality: 'India orientalis' (South & Skelton 2003: 722). Notes: According to Millar & Xia (1997), the type locality is Indonesia. English: Ceylon moss (Chapman & Chapman 1980). 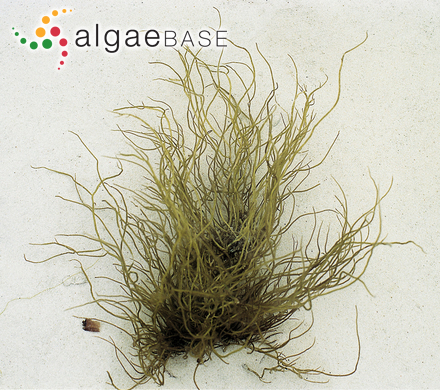 Indonesian: Jafna moss, Agar-agar (Kirby 1953), Doejoeng (Chapman & Chapman 1980). Indonesian: Doejoeng, Djanggoet (Chapman & Chapman 1980). Accesses: This record has been accessed by users 3017 times since it was created. Soe Pa Pa Kyaw, Mya Kyawt Wai, Thida Nyunt, Mu Mu Aye & Soe-Htun, U. (2009). 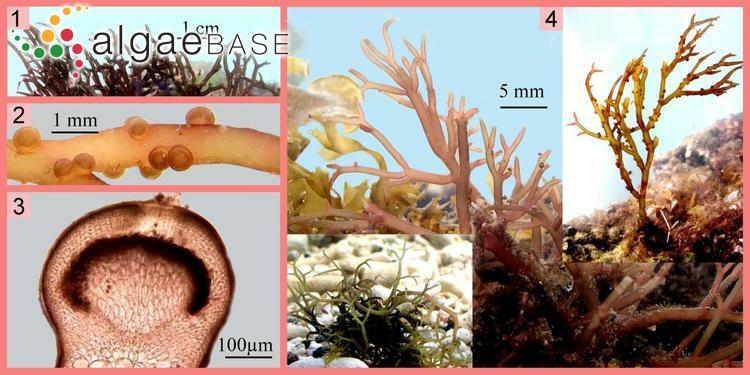 Some observations on the daily growth rate of the agarophytes, Gracilaria gracilis, G. canaliculata and Hydropuntia edulis (Gracilariales, Rhodophyta), from Kyaikkhami and Setse, Mon State. Journal of Myanmar Academy of Arts and Science 7(5): 333-346. Vo, T.D., Nishihara, G.N., Kitamura, Y., Shimada, S., Kawaguchi, S. & Terada, R. (2015). The effect of irradiance and temperature on the photosynthesis of Hydropuntia edulis and Hydropuntia eucheumatoides (Gracilariaceae, Rhodphyta) from Vietnam. Phycologia 54(1): 24-31.